With the deep knowledge of mechanical and other industrial work processes, we understand very well the requirement of proper tool necessary for the respected procedure. An organized toolkit pleasantly helps the operator to focus significantly on his task. Maxstor is a popular manufacturer and supplier of workbench in India. 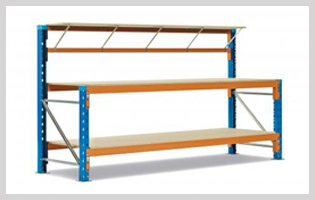 We have designed and developed an immense range of the workbench for almost industries. Assembly table, also called assembly workbench is widely used for many industrial activities. Along with assembly workbench, we also offer electrical workbench. Sturdy construction of workbench allows it to be loaded with up to 1500 kg UDL. It is flexibly suitable for the heavy load. It is made from the high grade material. Rigid welded joints provide it a vibration free and smooth operations capacity. Our range of workbench includes the mobile workbench, portable workbench, drawer workbench, steel workbench, heavy duty work bench, and industrial work bench and assembly workbench. It is specially made for the different kinds of cargo, food packaging industry, electrical industry and suitable for the short product life cycles. For the assembly, the workbench tops are made to provide effective protection against the oil, grease, water and dirt.